Las Vegas, NV — January 10, 2018 – Konami Gaming, Inc. announced a diverse array of original progressive games and video slot themes featured at the 2018 ICE Totally Gaming event in ExCeL London. This February 6 – 8, an estimated 30,000 guests have the opportunity to explore a record variety of progressive game styles spanning symbol-trigger, linked, wheel-spin, mystery-trigger, pick ‘em, and more—with leading flexibility and adaptable configurations for different market conditions. Konami stand #S6-110 will have a full lineup of SeleXion multi-game cabinets, including the ICE debut of SeleXion on its 43-inch curved Concerto Crescent with games such as Lotus Land Deluxe Wild , China Shores Great Stacks , and Dragon Fury together on one machine. Power Boost Inferno will be among the centerpiece progressive game attractions. This all-new linked progressive for Concerto upright and Slant allows players to activate more prize opportunities on a 3-round wheel-spin bonus at higher extra bet amounts. Similarly, Konami’s fiesta-themed Smash Smash Festival will also be a featured linked game at ICE and allows players to select their own extra bet amount, with greater bonus odds at higher extra bet levels. Power Boost Inferno and Smash Smash Festival both offer advanced compatibility with SeleXion multi-game and combine with most KP3+ platform base games, including Chili Chili Fire and Dragon’s Law Twin Fever. 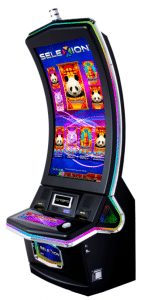 Konami’s Cai Lai Si Ji pick ‘em style progressive series has proven top performance for markets around the world and has quickly become a player favorite with its 5-figure mega jackpot chance. The series spans several custom base game titles and is available for Concerto upright and Concerto Slant. Directly neighboring Cai Lai Si Ji at ICE is another new bonus series launching with debut titles Celestial Sun Riches and Celestial Moon Riches. In addition to its multi-denomination capabilities and bet multipliers, this series invites players to increase their bet level in order to expand a special reel area called the Strike Zone for additional bonus opportunities. Konami’s Castlevania themed slots are arriving to ICE for the first time this February. The game’s debut launch titles have a 4-level standalone progressive bonus in which players battle against fierce monsters and Dracula himself for a chance at the jackpot. Lucky O’Leary Jackpots is another exciting release on Crescent, bringing Leprechaun’s magic to the machine’s elegant HD curved display for a rainbow of symbol-based jackpot adventure. During ICE 2018, Concert Crescent will feature SeleXion multi-game functionality for the first time. 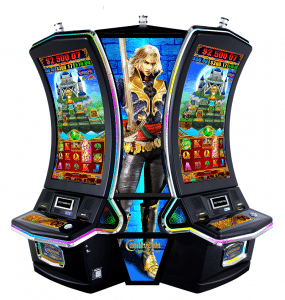 Operators can custom select a mix of player-favorite Konami Crescent games for each machine, with the option to add a standalone or linked progressive. It offers a versatile solution to feature a rapidly expanding library of single screen game releases from Konami. Guests at ICE Totally Gaming are encouraged to visit Konami stand #S6-110 at ExCeL London on February 6 – 8, 2018 to explore these and more new releases. For more information about Konami Gaming, Inc., please visit www.konamigaming.com.